Arrived last week. Got it for $30 (incl. shipping) from someone in Colorado. I prefer these old Komandirskie cases with the crown guard. OhDark30 and lucky watch like this. This just came in the mail today. I'm not exactly sure why I ordered it, but its growing on me. amil, OhDark30 and lucky watch like this. Here is my Dirskie. 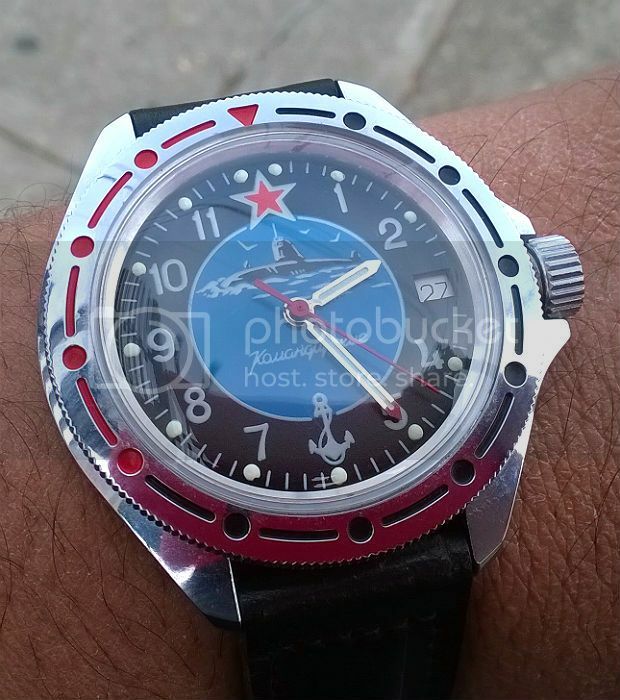 My first Vostok and what got me hooked on them. I however am not a fan of the bezel, so I ordered a different one from Zenitar and am very happy with the new bezel. Changes the whole look of the watch. REDSWAN13 and RobNJ like this. Love the Kom and love the strap! Kisifer, amil, pacorolex and 2 others like this. Kisifer, REDSWAN13, lucky watch and 2 others like this.